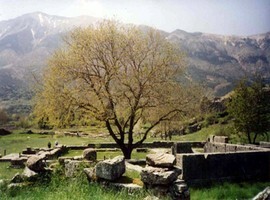 The ancient Dodona was one of the important political and religious centers of Ancient Greece since the prehistoric era. The sacred oracle was the oldest and the most beloved of the gods, after Zeus appointed the oracle to himself. The starting point of worship lies in the third millennium BC (First season 2.500 BC copper age) with the worship of the goddess Earth, the Great Mother and it sets with the prevalence of Christianity at the end of the 4th century AD. 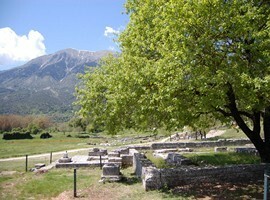 The oracle is located 22 km. 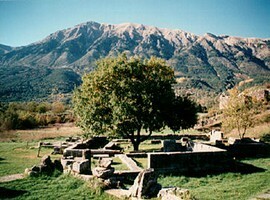 South of Ioannina, on the foothills of the ancient mount Tomaro and at a height of 600 meters. Here the worship of Zeus and Dione (as his wife) took place, in conjunction with the sacred tree, the oak, where the divine couple resided. The oracles were given with the help of the oak’s rustling leaves and the honk of sacred pigeons nesting there. Priests would also interpret the sounds made by the copper boilers standing on tripods that surround the sacred tree. The questions asked were inscribed on tin plates, many of which have been found in excavations. 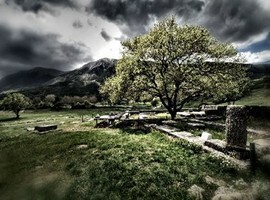 For many centuries the worshiping took place outdoors, around the sacred oak tree. 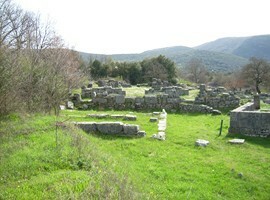 At the end of the fifth century BC the Holy House was built which was a small simple temple. Later, the temple began expanding with precincts and arcades and became larger and brighter. 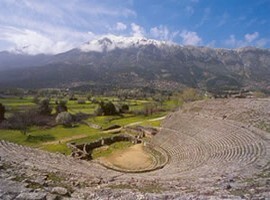 The theater of Dodona is the largest and one of the best preserved of the ancient Greek theaters, with a capacity of about 18,000 people. 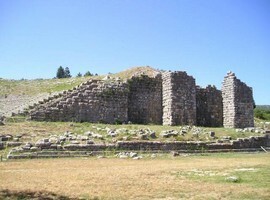 An integral part of the sanctuary of Dodona for the visitors, it was the most visible monument, which dominated the area with its curved surfaces and its imposing retaining walls. 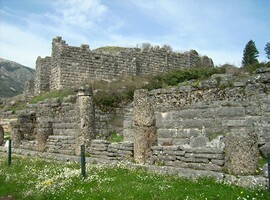 Built in the 3rd Century BC, the ambitious building program was carried out by Pyrrhus, king of Epirus, in order to reshape the sanctuary and to give it a monumental character. The auditorium was divided by four lanes to three horizontal sections (19 rows of seats down, 15 to 21 in the middle and top) and with ten scales in nine rows. The access of the spectators was made possible by large scales ranging from the lanes and their withdrawal by a wide outlet to the top of the central radius. 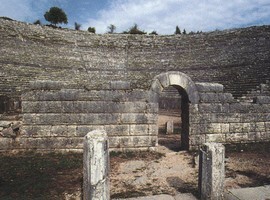 The orchestra was not a full circle and had a diameter of 18.70 m. In its center a carved rock formed the base of the altar of Dionysus, Thimeli. The scene of the theater was a two-story rectangular building. On the edges of the scene there were two rooms, the backstage and between them there were four pillars. 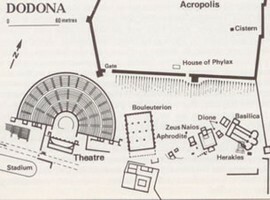 At the southern and the northern side of the stage stood Doric porticos which surrounded the road leading to the shrine, while at the east and west end there were lanes from which the audience and the actors entered the orchestra. 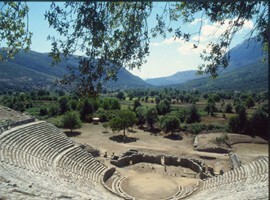 After the destruction of the shrine of Dodona by the Aetolians, in 219 BC, the theater, like other buildings of the sanctuary, was rebuilt. 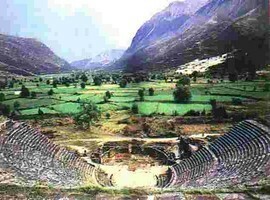 The theater was maintained in its new form until 167 BC when Macedonia and Epirus were occupied by the Romans (Paul Emile) and the temple was destroyed again. 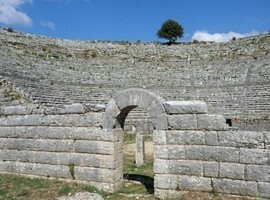 The scene of the theater was burned down and it was restored after the constitution of the League of Epirus in 148 BC In place of the columns, which were among the backstage, walls were built with lime and stones. 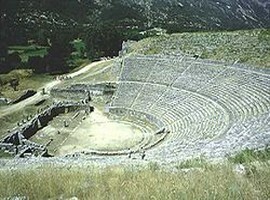 The normal form of theater however would not be sustained for long because in the first century BC, the monument was transformed into an arena.